The 9/11 attacks gave birth to a Manichean world which is, as I write this, being played out in Syria and Iraq amongst other places. 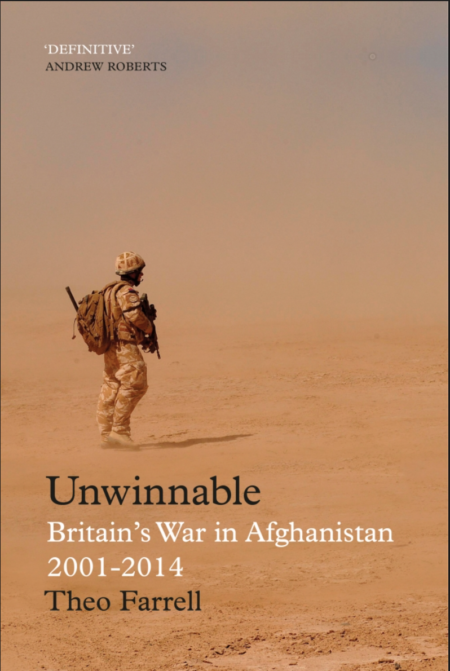 With this world in mind and the upcoming 9/11 anniversary, Professor Theo Farrel’s Unwinnable is a timely reminder of the consequences of the War on Terror in terms of lives, treasure and more; thousands of Afghan migrants clustered in Calais and Dunkirk hoping to cross the English Channel, and the phenomenon of British Muslims who travelled to Afghanistan, some for aid work some to fight creating a pattern of behaviour for future conflicts in the Muslim world. Zeeshan Siddiqui, a young SOAS student, after hearing of the 9/11 attacks, knew that Afghanistan was going to be hit. He wasn’t sad that the Twin Towers had fallen, he was swimming in a milieu that celebrated the Afghan Jihad, the Arab contribution to Bosnia, Bin Laden’s exploits against the USS Cole, Emir Khattab’s fight against the Russians. According to a source, Zeeshan went to fight the coalition; one of his friends, Abdur Rahman also known as Anthony Garcia, went with al-Qaeda; others preferred to go with the Taliban. Those who went with the former did ‘madness’. As for Zeeshan, this highly eccentric character was sold to Pakistani intelligence officers by an Afghan for a bag of rice, he was allegedly tortured to extract information with the knowledge of British intelligence agents. Siddiqui then returned to the UK and was put on a control order. He was sectioned for mental illness. He escaped and stayed in the house of a Libyan man who took him in. Zeeshan lived in the basement teaching Quran to his children for seven years before escaping to Somalia where he was purportedly killed in the ranks of al-Shabab. Zeeshan’s story shows how immensely complicated the story of the Afghan invasion is. It shows how no one in the story, from the British, Pakistani, Afghan and indeed Zeeshan himself does not come out clean in this story. How did we get there? This is where Farrel fills us in on the intricacies. Farrel relays extensive research spanning for over half a decade, incorporating British, US as well as Taliban sources. He tells the story of the invasion of Afghanistan effortlessly flitting to the invasion of Iraq, the dingy cabinet room in Cabinet Briefing Room A (COBRA), to the shady games played by the ISI and the CIA, to displays of venal corruption of warlords to the civilians facing the option of destroying their poppy crop or starvation. Farrel’s account is a British perspective for sure, but he doesn’t hide from the ugly bits whether that be torture or the document plagiarised from the internet, Downing Street issued as their casus belli for invading Iraq; he tells the tale with fairness and verve. The ease in switching from weapons specifications to various fields of operation and countries is remarkable. But then again Professor Farrel has over forty books on the subject of war and conflict. The notes alone for this tome is over a hundred pages. The first few chapters dealing with the road to war are perhaps the most compelling but that is well trodden ground. Lawrence Wright’s Looming Tower comes to mind. Farrell shows Blair to be statesmanlike in his approach and in full support of invading Afghanistan, interestingly less so Iraq. He believed that the Islamic emirate of the Taliban was responsible for harbouring al-Qaeda and should have complied to the demands of the US in handing over Osama bin Laden. In this respect Farrel says that the attack on Afghanistan was a-strategic. It was not necessarily a rational decision but a response was warranted. On the other hand, he notes that the Taliban was making overtures for negotiation. The 9/11 attacks was a surprise even to the Taliban who found out about it on the news. Had the US taken into account the Afghan customs of hospitality instead of giving non-negotiable terms such a costly invasion could have been avoided. At the time though the Taliban and al-Qaeda were viewed as one and the same. In any case, attacking Afghanistan was seen as a way to finish off the Taliban, a group that looked like a throwback to the Stone Age who repressed the educational development of women, demanded men to grow facial hair and destroyed, not unlike IS, the Buddha statues of Bamyan- a testimony in fact, to Muslim tolerance. But in taking such a decision the US and the British had set a dangerous precedent: this was violating notions of national sovereignty. Blair believed that in an increasingly globalised world humanitarian interference was necessary. Some likened it to a ‘white man’s burden lite’ if you will, and it was this idea that complicated matters further. For once the Taliban and al-Qaeda had been defeated the British should have left, the initial war objectives had been achieved, the Taliban’s spine had been broken and al-Qaeda was in disarray. Whilst the US administration cared little for nation building and stabilisation, for the British, Afghanistan was about nation building and stabilisation. Blair believed that nation building and stabilisation were the key in Afghanistan in order for the Taliban or al-Qaeda not to make a return. That of course meant development of infrastructure. From the squaddies’ perspective there seemed to be some justification to development, for when an Afghan governor defecates in front of your barracks as an expression of his contempt it becomes difficult not to view the populace as being in need of development. But these aims were not necessarily shared by its coalition partners. For the US it was all about counter insurgency, it was about tough marines cracking Taliban heads, whilst Rumsfeld eyed up Iraq. The Germans and the Dutch were only willing to take part in peace keeping. Having no clear war aims, a mass of British brigadiers wrangled with politicos and war lords and ex-mujahideen- the role of the coalition appeared more and more like occupiers. The coalition failed to grasp the sheer complexity of the country; its tribal politics, patronage systems and the culture itself. Thus night raids by special forces might have been successful in the short term but it violated Muslim and tribal honour. It put innocent Afghans in Guantanamo even though they didn’t have any connection with the Taliban or al-Qaeda whatsoever: the rival sub-tribe sold people out to the Americans. There were few men like Michael Semple who knew Pashto and Dari and their customs and knew Aghanistan’s ways and mores. Whilst the Marines and British might have fought the good fight, the Taliban too made a steady return, fighting doggedly often bolstered by well-trained foreign fighters and with the support of Pakistan’s Intelligence services. Morale for the Taliban was undiminished as Farrel makes clear: to the Afghan fighting the invading kafir, or infidel, and dying in battle meant paradise. But on the ground, the squaddie, the soldier in the Afghan national army and above all the civilians paid a heavy price. Stabilisation meant at times, coalition forces losing their reason for being in Afghanistan, from Guantanamo, to murders in Bagram, to air strikes wiping out entire families, to fighting alongside warlords who raped kids and extorted the populace and flooded their own countries with heroin. It was no wonder that though many Afghans had been glad to see the back of the Taliban, the actions of the coalition had turned an insurgency into a popular uprising and the Taliban became resurgent. Despite having two capable US generals in the guise of Petraus and McChrystal concentrating like never before in defeating the Taliban, the latter understood and drew strength from a ‘myriad of local conflicts between rival kinship networks over resources and state funds’. Moreover, the ramshackle poppy eradication scheme pushed the local populace in to the arms of the Taliban who had previously been successful in eradicating it. It is as one of the elders in Farrel’s book says all that the British has brought with them is death. In the end, British ambition was so staggering that it was akin to the Enlightenment and the Marshal plan and set with in the challenges of the Hundred Year War. Farrell’s book is immensely valuable both in its detail and lessons learnt; parallels can no doubt be found in the current conflict raging in Syria and Iraq even though its peoples and customs are different. The conflict in Afghanistan, as Professor Farrel rightly concludes, is unwinnable; initial successes turned into a quagmire – diplomacy and reconciliation seems to be the best way forward. This story is the result of drinking your own koolaid, the one meant for others, i.e. : P.R. The last paragraph sums it all up, initial success, turned into a quagmire.